I was in Nuremberg last weekend for Indie Web Camp. It was great. At some point I really should stop being surprised by just how much gets done in one weekend, but once again, I was blown away by the results. On the first day we had very productive BarCamp-like discussion sessions, and on the second day it was heads-down hacking. But it was hacking with help. Being in the same room as other people who each have their own areas of expertise is so useful. It really turbo-charges the amount that you can get accomplished. For example, I was helping Tom turn his website into a progressive web app with the addition of a service worker and a manifest file. Meanwhile Tom was helping somebody else get a Wordpress site up and running. Actually, that was what really blew me away: two people began the second day of Indie Web Camp Nuremberg without websites and by the end of the day, they both had their own sites up and running. For me, that’s the real spirit of the indie web—I know we tend to go on about the technologies like h-card, h-entry, webmentions, micropub, and IndieAuth, but really it’s not about the technologies; it’s about having your own place on the web so that you have control over what you put out in the world. For my part, I was mostly making some cosmetic changes to my site. There was a really good discussion on the first page about home pages. What’s the purpose of a home page? For some, it’s about conveying information about the person. For others, it’s a stream of activity. 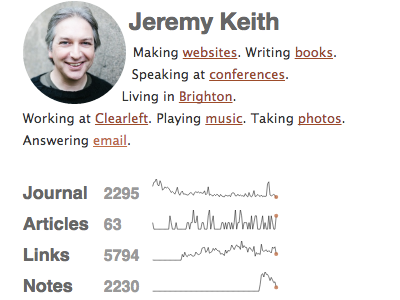 My site used to have a splash-like homepage; just a brief bio and a link to the latest blog post. Then I changed it into a stream a few years ago. But that means that the home page of my site doesn’t feel that different from sections of the site like the journal or the link list. I’ve already got sparklines on Huffduffer and on The Session so I suppose it was only a matter of time before they showed up here. I’ve been tweaking them ever since I got back from Germany. Now I’ve added in a little h-card bio as well. Initially I was using the fantastic little scripted SVG that Stuart made , the same one that I’m using on Huffduffer and The Session. But Kevin pointed out that a straightforward polyline would be more succinct. And in the case of my own site, there’s only four sparklines so it wouldn’t be a huge overhead to hard-code the values straight into the SVGs. Yesterday was the first day of Render Conference in Oxford (I’ll be speaking later today). Sara gave a blisteringly great talk on (what else?) SVGs and I got so inspired I started refactoring my code right there and then. I’m pretty happy with how the sparklines are working now, although I’m sure I’ll continue to play around with them some more. There’s another activity visualisation that I’m eager to play around with. I really like the calendar heatmap on my Github profile. I could imagine using something like that for an archive view on my own site. Luckily for me, I’ll have a chance to play around with my website a bit more very soon. There’s going to be another Indie Web Camp in Germany very soon. Indie Web Camp Düsseldorf will take place on May 7th and 8th, right before Beyond Tellerrand. Last year’s event was really inspiring. If there’s any chance you can make it, you should come along. You won’t regret it. Last week, on Richard’s recommendation, Jessica and I went out to eat at relatively new Kemp Town establishment, The Ginger Dog—all in the name of research for Prinicipia Gastronomica of course. Being relatively new to this neighbourhood, I wanted to make sure we didn’t go astray. 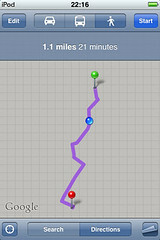 I don’t have an iPhone but I do have an iPod Touch so, before leaving the house, I loaded up the map app with walking directions. Even though I didn’t have 3G, or even WiFi, to help me on my perambulation, the iPod Touch does have triangulation. So every time I checked the map, a blue dot marked my spot. I just had to make sure that the blue dot didn’t stray off the purple line. On the way back, I opened up the map app again to retrace my steps. This time, the map tiles didn’t load. 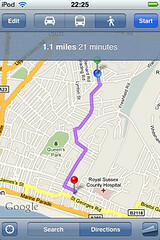 But my route home was still marked in purple, and the blue dot still showed my position. That’s when I realised that all the other information on the map—the streets and landmarks—were irrelevant to the task of navigating my way from A to B. All I needed to do was keep the blue dot on the purple line. It’s the minimum information density for wayfinding: the mapping equivalent of a sparkline. Microsoft are trying to patent sparklines. Twunts. I’m back in Ireland for a little while. ‘Tis the season for merrymaking, munching mince pies, imbibing wine and—if you’re a geek—fiddling with code. That’s what I’ve been doing, sitting by the fire with my Macbook on my lap, hacking on Huffduffer. I’ve been messing around with Google’s Chart API. 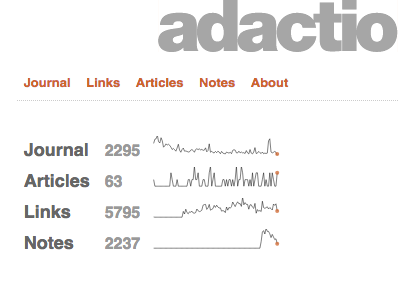 I thought it would be nice to have some discreet little sparklines on profile pages. I had a little help from the ghost of Christmas past in the form of Brian’s 24 Ways article from last year. The data I’m graphing is activity over time (huffduffing in this case). The time stamp of the first action is the starting point. The current time stamp is the end point. This timeline is then divided into 50 equal parts; the final sparkline will be 150 pixels long, giving 3 pixels per time period. Each action is allocated to the appropriate time slot. Once that’s done, the results are normalised according to the largest amount. So if the maximum activity in the timeline is six, then six becomes 100%; if the maximum activity is just one, then one is 100% and the resultant chart will be quite spiky. 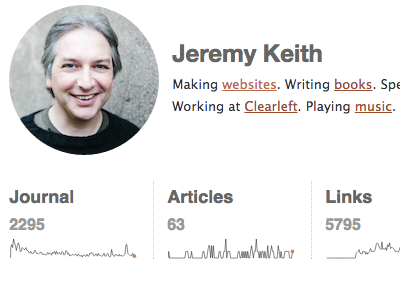 You can see an example sparkline on my huffduffer profile, showing my huffduffing history at a glance. 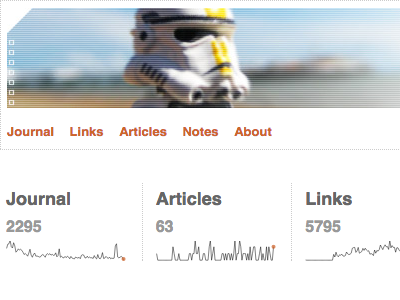 While I was at it, I added sparklines to tag pages as well. Here’s the tag page for “music”. I’ve styled them so that they don’t stand out too much. They’re supposed to look like quick pencil sketches. For more than you ever wanted to know about sparklines, here’s Sparklines: theory and practice from the Ask E.T. forum.